You don&apos;t need a plane ticket to France for an outstanding culinary experience - just visit Eugene, Oregon instead. Like in France, farm-to-table dining is a staple of the Willamette Valley region and it&apos;s one of the reasons I love this area so much. My "trip to France" was in downtown Eugene at Chef Stephanie Kimmel&apos;s flagship restaurant Marché & Le Bar. This amazing chef is an industry leader, championing seasonal ingredients and local products including Oregon wine. 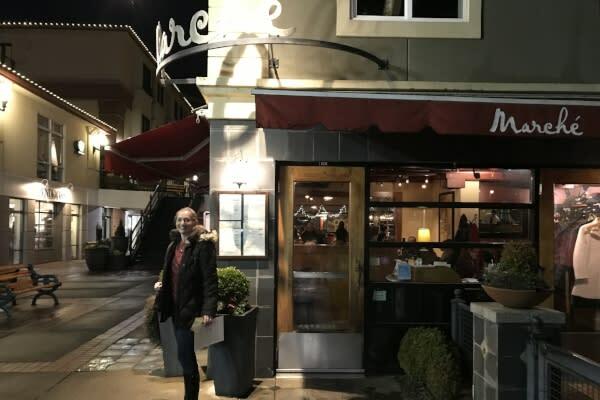 Marché has been hosting special French regional dinners with wine pairings for over nineteen years. My sister and I had once spend a glorious summer backpacking from Normandie to the Côte d&apos;Azur and I still remember divine bowls of soupe de poisson, endless crêpes and long, lingering dinners. We decided it was time to refresh our culinary memories. We had an early reservation but Marché&apos;s dining room and bar were already humming when my sister and I were seated at a two-top by the window. 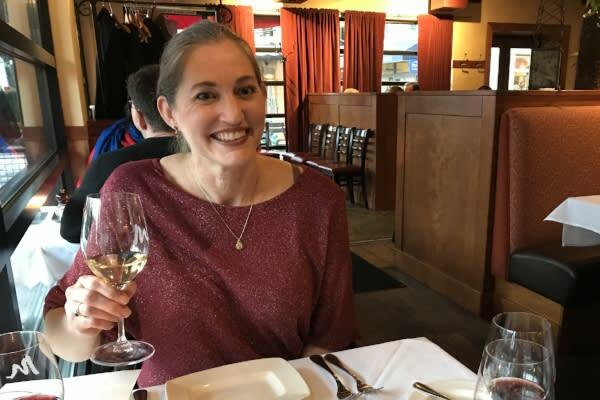 As neither of us are big drinkers, we elected to split the wine pairing flight ($25) to accompany the four-course prix fixe tasting menu ($50 each). The wine dinner was featuring Savoie. It was a French region I knew very little about. Luckily, the menu provided an interesting write-up so we could get a sense of place. In summer, the mountainous terrain supports dairy cows (it&apos;s known for its cheeses), wild game and mushrooms. Trout are plentiful in the mountain streams. Despite the high elevation and rugged slopes, Savoie has vineyards with adapted grape varieties for producing small batches of wine not commonly exported. Gamay and Mondeuse varietals are the most well known, and I noted such selections were listed on the evening&apos;s menu. Traditional food preparation from this region is simple with some Italian influence. 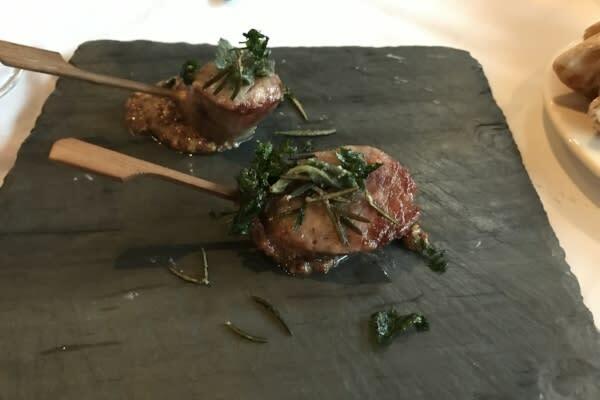 The first course was "Saucisson Savoyard", a pork sausage with a juniper berry mustard and fried herb salad. It was presented on a slate and served with a 2014 Chardonnay from Arbois. We enjoyed the wine pairing immensely, noting how well the wine complemented the strong sausage and mustard flavors. The next course was "Galette aux Champignons" which was a mushroom tart with Douceur du Jura cheese. It was also a hearty offering with the rustic culinary nuances attributed to the Savoie region. The tart paired with a 2015 Gamay from Jongieux. 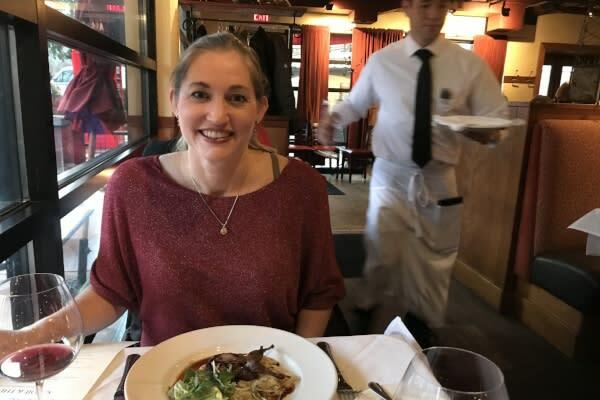 What thrilled me as we dined was that this "French" meal was primarily sourced locally with ingredients from the Willamette Valley and the Cascade Mountains - all but the imported French cheese and wines, the server assured me! For the main course we had a choice between roasted quail or panfried trout. Considering all the local fishing our family does, my sister and I eat fresh trout on a regular basis - so we skipped that option. (Although, my sister did note that it would probably be the best presentation of trout we&apos;d ever enjoy because of Chef Kimmel). The roasted quail was served with a potato-leek gratin and watercress salad and paired with a 2015 Mondeuse from Savoie. I have to admit that when that little bird was served, with its petite legs and wings all askance on its bed of potatoes, we choked back our giggles and had second thoughts about eating the poor quail. But its delicious meat soon erased our hesitation. Though challenging to eat, the quail was very satisfying - and I could picture myself feasting on just such a dinner in some Alpine lodge by a roaring fire. Or rather, it was also fitting for a McKenzie River lodge! The sweet finish was "Pain de Pistaches" which was a pistachio-almond cake with kirsch cream and preserved cherries paired with a red Macvin du Jura (wine fortified with brandy). The cherries also packed quite a punch, almost worthy of being considered a dessert or "after dinner drink" all by themselves. As strong as they were, I could not refrain from enjoying them all. But I was only able to eat a partial bit of the cake before surrendering. Satiated and happy, we thanked our server and sommelier. While reluctant to depart the elegant and lively atmosphere, it is a comfort to know that any time we want to reminiscence about France&apos;s culinary scene, we only need to come downtown. I&apos;m ready for my next "travel" plans! 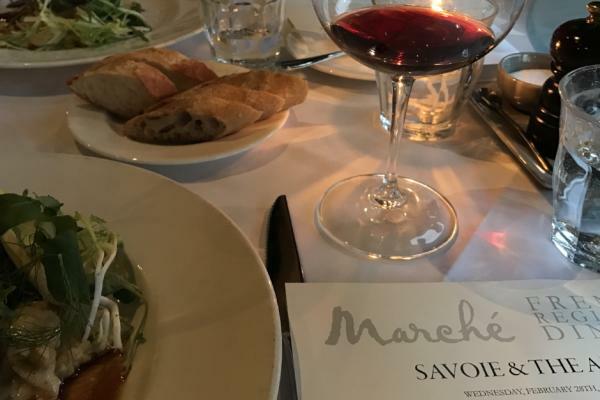 Along with Marché&apos;s French regional wine dinners, their adjacent Provisions Market Hall offers French cooking classes with Stephanie Kimmel and regional wine tastings. New this year are French regional tasting tours build around a classroom format. See their calendar of events.